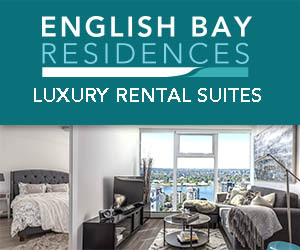 The Fraser Valley is right in our backyard and it’s full of farm-fresh goodies, unique dining options, refreshing lakes, beautiful hikes, and live entertainment. 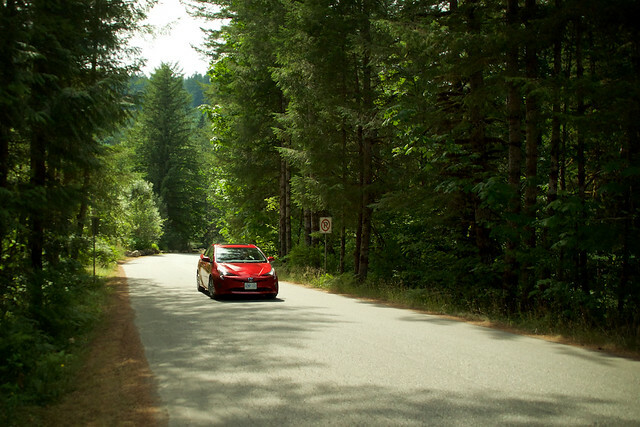 It’s a summer playground that’s more accessible than even, especially if you’re taking a day trip in a hybrid vehicle. 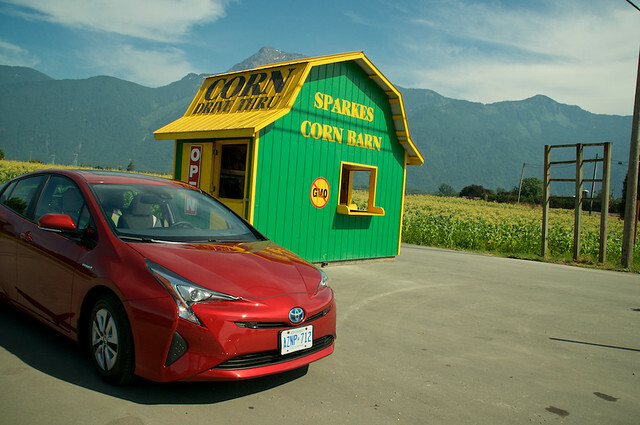 I drove 375km the other day from West Vancouver to Port Coquitlam, and out to the Othello Tunnels in Hope, BC, in a Toyota Prius. Stopping for lunch, to shop at markets, and at the drive-through corn booth in Agassiz, I returned to the North Shore with an impressive fuel economy reading of 3.9L/100km. This means that for all the driving I did, I topped up the gas tank with just $14 of fuel. 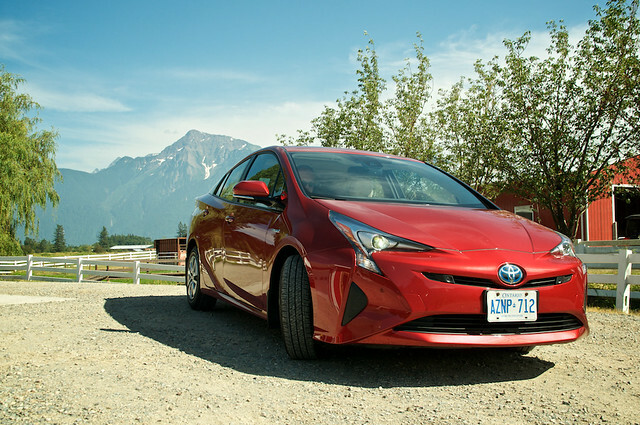 I have put together three itineraries for you to explore yourself, and if you’re in a hybrid, it could cost you less than 3 cents/kilometre for an action-packed day of fun. 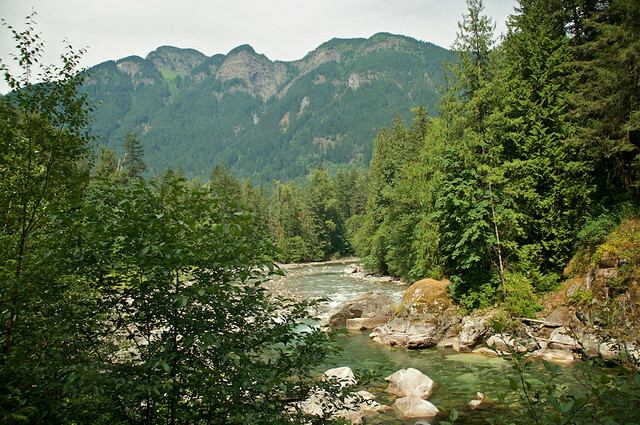 To give you some inspiration for day trips to the Fraser Valley, I have put together three different itineraries. Follow one, follow them all, or mix and match for an ultimate local road trip. There’s a such a bounty of Fraser Valley goodness to enjoy, from cheese to berries and honey. 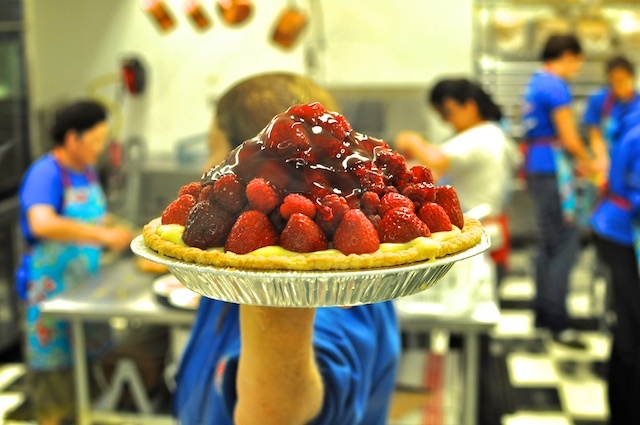 At Krause, they serve up legendary (and gigantic) strawberry pies. Campbell’s Gold has delicious honey from their very own bees, along with award-winning mead. Farmhouse is a fun place to explore with cheese, ice cream, and animals out in the pasture and in their big red barn. 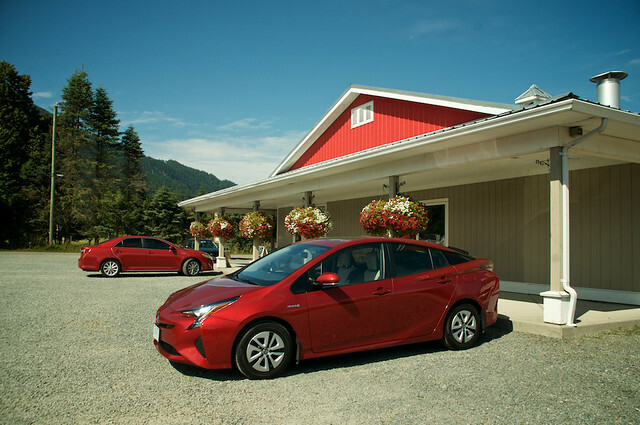 While I was at The Farm House Natural Cheese another red Toyota hybrid pulled into the lot! One thing I love about the valley is you can shop for farm-fresh goods and it’s always convenient, like this drive-thru corn stand I found in Agassiz. From the country to the canyon, the city to the valley’s serene landscapes. 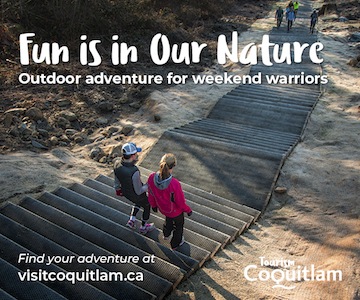 Make your way out to the far reaches of the “604” from Vancouver with this more active itinerary. 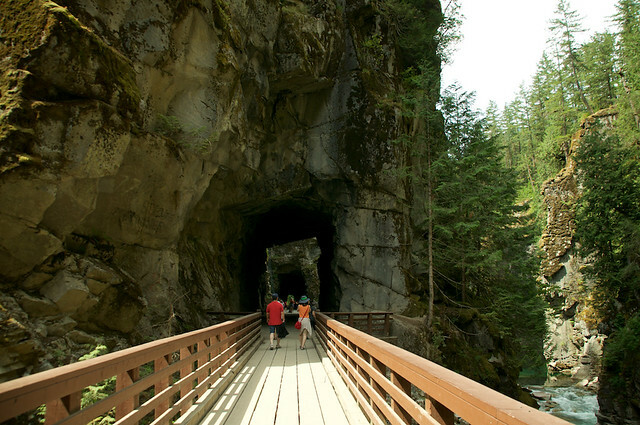 I spent some time walking through the Othello Tunnels at the beautifully scenic Coquihalla Canyon Provincial Park. I hadn’t been there since I was a child but I remember how much I loved the mix of local history, engineering, and the impressive natural architecture. 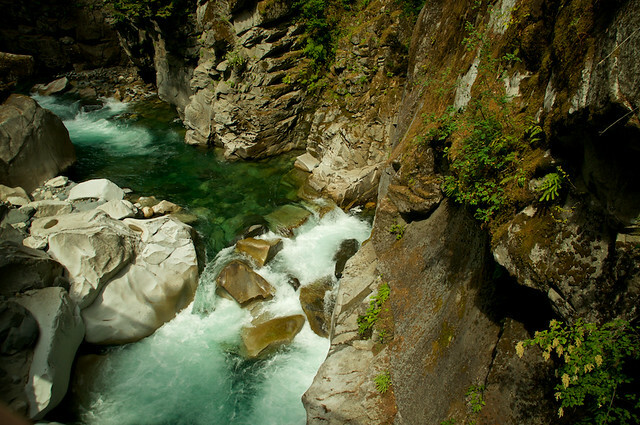 In the Coquihalla Gorge, the river cut a 300-foot-deep channel of solid granite. A straight line of tunnels was built through it, which is known now as the Othello Tunnels. This park highlights the Kettle Valley Railway grade that passes through the canyon and five tunnels which were built in 1914. The hiking trail links to the historic Hope-Nicola Cattle Trail. I spent the afternoon going between the warm, humid canyon to the cool, damp, tunnels, and of course taking a lot of photos. A family could spend a lot of time here hiking, fishing, and in the picnic area. On a warm summer day, you really appreciate the luxury features that can be found in your vehicle, between explorations and expeditions. 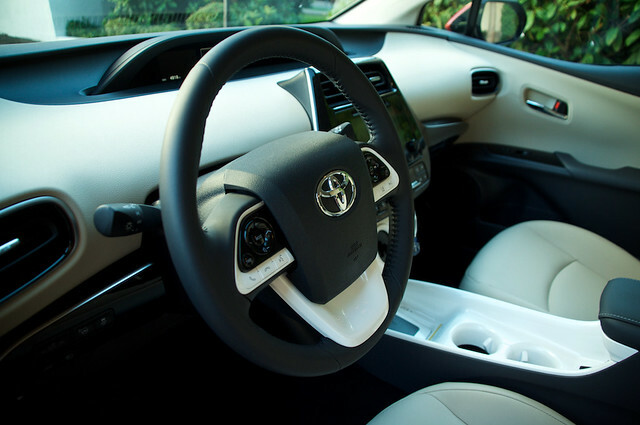 Aside from the A/C, the Prius has Bluetooth connectivity, premium sound systems, upgraded wheels and tires, high quality interiors, and additional options. The price of a gasoline engine vehicle equipped with the same features is very comparable. 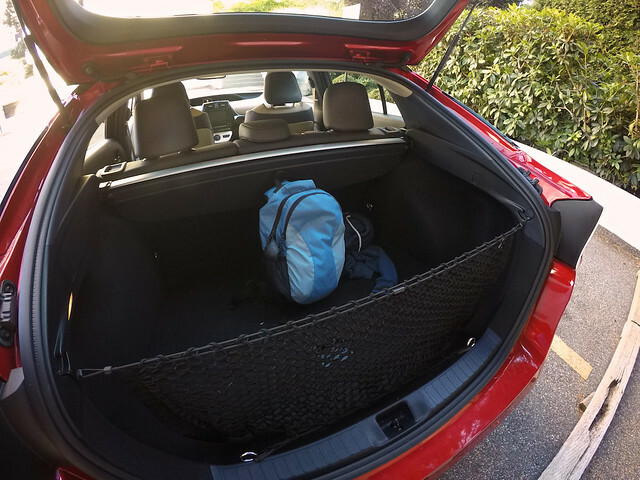 I only packed a backpack for the day, but was also impressed by the amount of space in the trunk. The hybrid battery was barely evident and I could have even fit luggage for an extended road trip in here. Here’s one more itinerary if you’re looking for some fun this summer that involves live entertainment, music, activities, and more for the family. Combine any of the foodie and hiking stops with these events and you’ll surely have an action-packed adventure in the valley this summer! 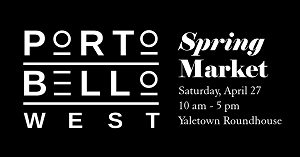 Event 1: Shop the Downtown Chilliwack Farmers Market, every Saturday until September 9th at Central Community Park. Enjoy live entertainment as you shop from local artisans and farmers. Event 2: Bands on the Beach, Labour Day Weekend at Harrison Lake. September 2nd & 3rd bring your lawn chairs and get ready to rock the end of summer with two days of great entertainment. Everything from Bluegrass to Indie to New Country. Event 3: The Fraser Valley British Motor Car Show and Family Fun Day is happening at Cultus Lake on September 10th. It’s a family picnic and a car show rolled into one in a gorgeous lakeside setting. 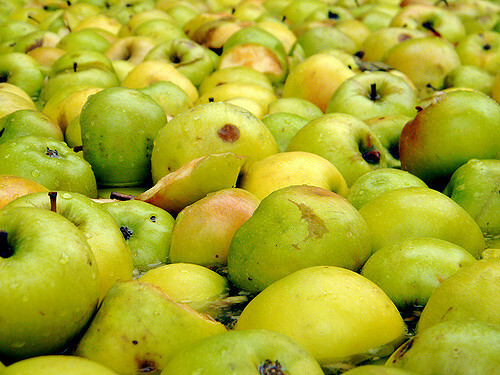 Event 4: Celebrate the season at Taves Family Farms‘ Apple Festival. 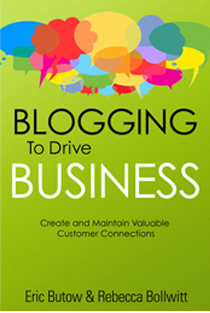 Full details have yet to be released but save the date for September 9th. The farm always has a petting barn, playground and slides, jumping pillow, tractor trail, corn maze and more every day too! Event 5: Historic Kilby is open throughout the year with some very special events on their riverfront property in Harrison Mills in September. You can celebrate the bounty of the season at the Autumn Harvest Festival September 10th. Witness an apple cider pressing demonstration, browse the mini farmer’s market for delicious local foodstuffs while the kids make autumn-themed crafts. It was great to drive such a fuel-efficient vehicle for a day, and I could have gone a lot further or even turned my day trip into a multi-day experience — all on one tank of gas. 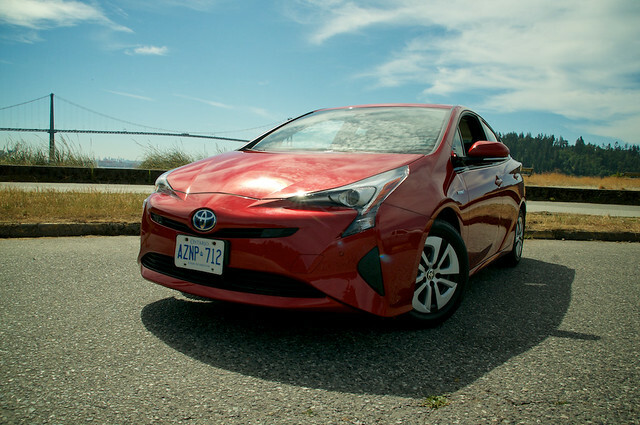 The Toyota Prius hybrid is among the most affordable cars to own, when factoring in depreciation, fuel cost, loan interest, insurance premiums, sales tax, and maintenance and repairs. The fuel savings leave you with adventures and memories, and more pocket change for that extra slice of pie at Krause Berry Farm. 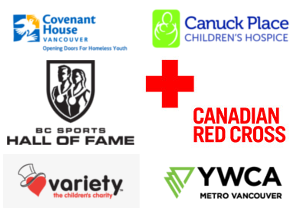 This post is sponsored by Toyota BC Dealers. Views are my own.